What is Industrial Janitorial Cleaning? Commercial flooring is designed to withstand the demands of high traffic, but that does not mean you need to sacrifice style. When it comes to commercial flooring options, it is possible to get a durable, easily maintained material that is also aesthetically pleasing. Depending on your business and the volume of traffic your floor receives, you’ll want to carefully select a commercial flooring option that holds up to heavy use while saving you money on maintenance, repairs, and replacement. So what do you need to know when considering commercial flooring options? Contrary to popular opinion, not every business will require commercial flooring for high traffic scenarios. However, if you operate retail stores, sporting facilities, gyms, hotels, restaurants, healthcare offices, or entertainment venues, you most likely need to choose from high traffic commercial flooring options. High traffic commercial flooring has a few distinct features. First of all, it’s built to be durable. Materials used for commercial flooring are chosen for their ability to withstand even the most intense traffic – whether that means the volume of traffic or the demands of that traffic. For example, consider the traffic in a restaurant compared to a warehouse – while restaurant flooring will receive a high volume of traffic and a warehouse will receive fewer people but more demanding traffic (related to footwear and warehouse machinery), both will need to meet minimum expectations for durability. Next, commercial flooring should be low-maintenance. Regardless of the type of flooring – whether commercial or residential, flooring will require regular maintenance. This includes cleaning, repairs, and occasional replacement. Commercial flooring is designed not only for durability, but to require minimal maintenance. And finally, commercial flooring is attractive. We often associate durable and low-maintenance construction with less visually appealing options. However, high traffic commercial flooring today is made to be visually appealing so that you don’t sacrifice quality for aesthetic. Generally, there are 4 main types of commercial flooring options. Concrete, hardwood, vinyl, and carpet are all materials that are used in commercial flooring. Each of these commercial flooring options has their own advantages and disadvantages. Concrete commercial flooring options are great for restaurants and retail spaces because they are durable and easy to maintain, but they can be very aesthetically pleasing because they can be customized with graphics or other finishes. Hardwood flooring is an increasingly popular commercial flooring option. These flooring options can be visually stunning and resilient, but they tend to require more maintenance than other commercial options. Artistic facilities such as dance or museum spaces are ideal for hardwood flooring. Vinyl flooring is affordable and available in a wide range of styles and colours, but tend to be somewhat less durable than concrete or even hardwood flooring. Still, depending on your budget you can find some highly durable and easily maintained vinyl flooring options that are a great choice for restaurants and healthcare facilities. Finally, carpet is a popular commercial flooring option when you want better noise control. 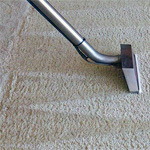 Carpet is durable and comfortable, but requires regular cleaning. You’ll often find carpet flooring in hotels and offices. If you’re trying to decide the best commercial flooring option for your business, speak to a flooring expert to ensure you choose an option that meets your needs with respect to durability, maintenance, aesthetic, and budget – of course!